James MacArthur gave his original "Hawaii Five-0" badge to his son, keeping this replica for himself. More than two decades after the CBS program "Hawaii Five-0" wrapped at the Hawaii Film Studio, the first Hawaii-based national TV series and co-star James MacArthur (Dan "Danno" Williams) will receive the Hawai'i International Film Festival's fourth annual Film in Hawaii Award. The award -- to be presented tonight during private ceremonies -- honors the person and/or organization who has "significantly contributed to the promotion of Hawaii's film industry." Previous winners have included Tom Selleck, star of "Magnum P.I. "; Disney Studios, which has filmed several major motion pictures here; and Eddie and Myrna Kamae. MacArthur's character gave the show its catch phrase, "Book 'em Danno," long before catch phrases became a TV series staple. "I was bowled over when I found out they wanted to give me and the show these awards," said MacArthur, 65. "'Five-0' had been out there so long it was completely unexpected. I'm thrilled to represent the show and Jack (Lord) would be too." About 20 people from the show -- the longest-running police drama in television history -- will attend the ceremony, including Al Harrington (Ben Kokua) and series creator Leonard Freeman's wife, Rose. Marie Lord, wife of the series star who played Steve McGarrett, is too ill to attend. From 1968 to 1980, 278 episodes of "Hawaii Five-O" were filmed here at a cost of $35.2 million, providing millions of dollars in publicity for the Aloha State. The hourlong shows are still aired worldwide. There are a dozen "Hawaii Five-0" Web sites, dozens of fan clubs and a $100-million motion picture by producer George Litto is in the works. MACARTHUR is sitting in the living room of his eighth-floor Diamond Head-view condo which overlooks the surf spot Tong's. He bought the unit in the very early "Five-0" years. "One of the best investments I ever made," jokes the Palm Desert resident who has been married to a professional golfer for 20 years. "It's great to stand up here with my binoculars and watch my (18-year-old) son surfing, and when I want him to come in I wave a big white towel." MacArthur played the approachable and lovable Danno -- police chief McGarrett's second in command. He has done little acting in recent years, content instead to oversee the works of his writer-father Charles Gordon MacArthur and allowing them to be produced in London. In January, "Twentieth Century," starring Alex Baldwin and Anne Heche, will open in New York. "I wouldn't mind doing some acting again, but I took time off to be with my last child," MacArthur says. "That's been my major interest." MacArthur also is "exploring doing some ideas in Hawaii ... a TV series," he said. "We've talked to development people and it's being considered. "When we started 'Five-0,' Hawaii was a mystical place ... not so easy to get to. But now, millions of people come each year, so it doesn't have the same allure, but still, Hawaii is a curiosity." 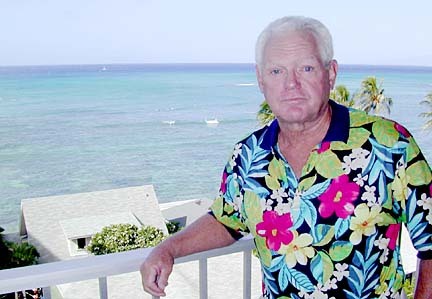 James MacArthur calls his eighth-floor Diamond Head condominium one of the best investments he ever made. He bought it in the early years of the TV show. THE SERIES was not an immediate hit, doing "all right" in the ratings the first few months, he said. Then CBS moved it so it wouldn't have to compete with the highly rated "Perry Mason." "Then we went through the charts and it never really slowed down," he said. MacArthur says the mystique of "Five-0" is as varied as its fans. "I was talking to a lady during a HIFF event and she said, 'I love to watch the show because you see all those little trees that are so big now,' " he said. "'Five-0' is like a beautiful woman. You don't know exactly what it is, but you can't stop watching. "The show had all the ingredients that work: The combination of the actors, the Hawaiian thing through Kam Fong's character Chinn and Zulu, and we did a lot of shows where the actors explained local Hawaiian customs to America through dialogue and plots. "But (the show's creator) Lenny (Freeman) insisted on quality in the writing. I really suspect that the reason there hasn't been another 'Five-0' is because they haven't found the next Leonard Freeman." Freeman, MacArthur said, kept his writers in Hollywood, ordering them "to write people and don't follow the palm trees and beaches. We'll set the scenery." Freeman also mandated that the "Five-0" team not wear aloha shirts because the anti-crime team would melt into the crowd. "So in long shots you knew who the guys in the suits were. The good guys." MacArthur, who has attended several "Five-0" reunions, said this may be the last one as crew members pass on. Lord died several years ago and Kam Fong died last year. MacArthur keeps little memorabilia and surprisingly never has visited the third-floor room at Iolani Palace where the fictional "Five-0" headquarters was located. 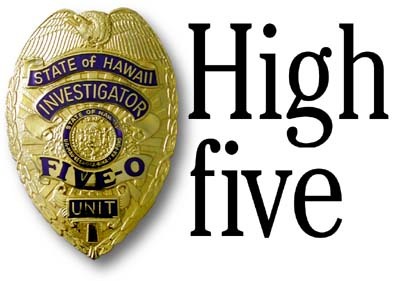 "I had my ('Five-0') badge but gave it to my oldest son after the show," he said. "What else is there?" MacArthur dodges a question about whether he'll appear in a "Five-0" film. "I think that's in the details to still be worked out," he said. But on his Web site the actor says, "I really don't think that's in the cards. I think any future 'Hawaii Five-O' movie will take on a very different tone, and I don't think there will be any room for the original cast." There's no hesitation when MacArthur is asked about his fondest "Five-0" memory. "Living in Hawaii," he said. "Most actors don't get steady work and I did for all those years and lived in Hawaii. Sure, we worked long days and Lenny and Jack were taskmasters, but when we were pau I came home to this view. Not so tough."